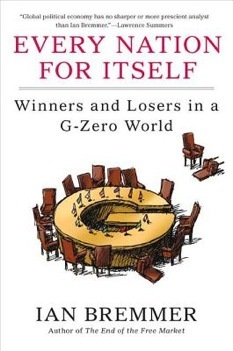 Ian Bremmer, one of America’s leading geopolitical theorists and President of Eurasia Group, sat down with Reza Akhlaghi to discuss the crisis of global leadership and his new book Every Nation for Itself: Winners and Losers in a G-Zero World. “…..a loose collection of developing countries feel that their growing economies should win them greater respect on the international stage. Yet these new players balk at assuming the risks and burdens that come with a share of global leadership, focusing instead on managing each delicate stage of their countries’ development. This reluctance is at the heart of the G-Zero”. A G-Zero world, however transitory a period, is primarily about growing instability and lack of coordinated action by leading established and emerging powers. How long can this period last without serious repercussions for everyone involved? As few as five and as many as 20 years. Some issues are likely to remain intractable even after a new order begins to emerge. But generally speaking, the absence of global leadership will ensure that small problems more often become large problems, and that large problems will sometimes become crises. The creation of these crises will force the states with most to lose to cooperate, just as they did briefly following the financial market meltdown on 2008-2009. Geopolitics hates a vacuum. Let’s turn our attention to a topic debated almost daily, and that is whether or not the U.S. is in decline. What are the key contributing factors in a G-Zero world that have so strongly fueled the debate around this topic? With a weak economic recovery and a fierce political debate over government spending, the U.S. is less willing to accept the costs, risks and burdens that come with an ambitious international leadership role. Acting as global policeman and lender of last resort is expensive, and U.S. taxpayers are not in a spending mood right now. But there is a larger, more structural issue. Even if the U.S. were still willing to lead as it has in the past, it would have fewer influential followers. So many of today’s rising powers have quite different political and economic values than the U.S. does. In years past, Washington had confidence that other strong powers, led by the Western Europeans and Japanese, shared U.S. confidence in the resilience of democracy and the power of free market capitalism. But as U.S. officials glance around the G20 table, they now face plenty of negotiating partners who don’t share these core assumptions. None of this really has to do with “decline” in absolute terms. But whether you believe that the U.S. has lost a degree of economic dynamism and international influence that cannot be recovered (I don’t believe that), it is clear that Washington is in no position to bail out Europe, stabilize the Middle East, or lead the way toward a global deal on carbon emissions. And neither is anyone else for the foreseeable future. You assert in your book that in a G-Zero world, in order to fuel its economic growth, China is increasingly involved in securing access to energy resources. The country, also based on your assertion, is concerned about its next stage of development. Do you think China and key western powers are bound to be locked in an intense rivalry over access to energy resources? Also, what are the key challenges for China in transitioning to its next stage of development? Given the ongoing natural gas-driven energy boom in the United States and the western hemisphere more broadly, a trend which remains in an early stage of development, energy probably won’t be the primary area of competition. Other scarce commodities might be a different story, but I believe we’re more likely to see trouble between the two countries in cyber-space than in resource-rich third countries. On China’s development trajectory, the problem is obvious to everyone. So obvious that China’s premier has publicly referred to China’s current economic model as unstable, unbalanced, uncoordinated, and unsustainable. There are many aspects to the reform challenge that lies ahead. China clearly cannot reach the next stage of its development by continuing to rely so heavily on exports to Europe, America and Japan. Or on exports generally. China must shift wealth from large state-run companies and industries to Chinese households in order to empower Chinese people to buy more of the products that Chinese workers produce. From a political point of view, the biggest challenge is that the most powerful of those state-run companies (and the commercial and political elites that profit from their operations) have the means to resist this change within the bureaucracy. And they will use their leverage and influence to protect their privileges and wealth. It’s much easier to create state capitalism than to dismantle it when it has outlived its original purpose. You argue that in a G-Zero world it is economic muscle, not military might, that determines the international balance of power. How should the U.S. adjust to this reality? Do you believe significant reductions in American defense budget and direct state involvement in coordinating corporate strategy will benefit the U.S. global economic interests? Washington needs to invest more time, energy, money, and political capital on developing a more robust long-term industrial policy. Some state involvement in corporate strategy will be necessary while maintaining the delicate balance between allowing business leaders to make business decisions and providing them support that boosts the broader U.S. economy. I’m not talking about protectionism. I’m talking about a government that knows that U.S. companies face state-subsidized, state-supported competitors and that is prepared to work with businesses to boost their competitive advantages. On defense spending, the U.S. can afford to spend less on the kind of hardware used to fight previous wars without losing its comparative advantage over other militaries. And spending should continue on research and development to extend U.S. cyber capabilities. In any future war between modern states, this will be a critical battleground. The book has a particular emphasis on cybersecurity, suggesting that we are presently experiencing the collision of international politics and cybersecurity. What are the dynamics of this collision and its potential implications? Governments around the world are developing cyber capabilities as a means of projecting power in a world where direct military strikes are expensive and dangerous. Some states will try to work together to shield public resources, like power grids, from cyberattacks, but in a G-Zero world, they aren’t likely to succeed in a consistent and coordinated way. As with terrorism, attackers only have to hit the target once to do enormous damage. Not surprisingly, we have witnessed the growth of a cyberwar industry, one in which fear of the unknown feeds demand for all kinds of offensive and defensive weaponry, tools created by companies that will sell to almost anyone who can pay—and without regard for the sorts of friends they keep and enemies they target. In addition, multinational firms face a growing need to protect themselves against cyberattacks that are launched, or at least supported, by governments looking to boost the fortunes of their state-owned companies. High-tech businesses are especially vulnerable, because the information they hold is unusually valuable for political officials who want to promote domestic industries and/or bolster national security. Do you think the U.S., despite its anemic recovery and the post-2008 crisis reforms in its financial sector, still faces the risk of financial disaster? Not anytime soon. There is much talk in the United States of a “fiscal cliff,” the impact on a sluggish economy of simultaneous scheduled tax increases and spending cuts. But lawmakers can see that threat from a mile away and have every incentive not to allow it to happen. The real risk is longer-term because the U.S. faces a sort of “safe haven curse.” Despite its deficits and debt, Washington can continue to borrow because lenders look at Europe and volatile emerging markets and still see America as the safest port in any storm. Ratings agencies downgrade the U.S., but 10-year treasury bonds are still finding buyers at exceptionally low interest rates. The real problem is down the road when the problem has grown and complacent U.S. officials haven’t done enough to prepare American taxpayers for a necessary rebalancing. Does Europe really need to chart a new course? How uncertain is the future of euro zone? Yes, fundamental changes are needed, and they will take time, but I believe that enough of these changes can and will be made to keep the eurozone alive and to strengthen it over the long term. There must be some form of tighter coordination on fiscal policy, there must be regional regulation of European banks, there must be greater flexibility in funding for countries and banks that need it (to reduce the likelihood that they WILL need it in future, and a lot of complicated changes have to be sold to millions of people in multiple countries. But all of these processes are already in motion. There will be many more twists and turns in this saga. There will be setbacks and headaches. But what we have is a multiparty complex rug negotiation. These various sides are quite far apart, but we have willing buyers, willing sellers and a series of agreements that must be made to avoid a catastrophe that would hurt everyone. I’m betting on ugly long-term success. The Iranian leadership and the West have been locked in a cycle of reciprocal threats, cyber attacks against Iranian nuclear sites, undermining of U.S. and western interests in Iraq and Afghanistan by Iran, and most recently the intensification of economic sanctions against Tehran. The negotiations over Iran’s nuclear program are nearing their first decade. Is this a reflection of living in a G-Zero world? Who are the winners and losers in this seemingly never-ending crisis? Yes, but as Pakistan and North Korea illustrate, containing the spread of nuclear material was a huge challenge even before the G-Zero era began to take hold. The G-Zero impact will be to make it that much harder to block (or even to delay) further proliferation because, without superpower leverage and the political will needed to use it, other countries will be less likely to accept the sacrifices that come with enforcing sanctions. The biggest winners in this scenario are those who have enough friends to help them flout the rules. The biggest losers will be the world’s “referees” as well as those who depend on them to enforce those rules. In your book you classify Israel as an “exposed state” part of those that are “most deeply dependent on U.S. strength and Washington’s willingness to use it to protect them.” As an exposed state, is Israel facing a new security environment and should the Israeli leadership come up with a new security doctrine that incorporates the realities of a new Middle East? Israel will face new pressure to make new friends and to minimize frictions with its neighbors wherever the country’s national security is not directly at stake. In particular, there will be a surge of pressure on Israel’s leaders to find some sustainable resolution to the conflict with Palestinians while securing Israel’s borders. The United States will be less willing over time to take on expensive new headaches in the Middle East. Israel will need stronger ties with moderate regimes like Turkey and to minimize conflict with Arab governments like Egypt’s in which public opinion is now having a bigger impact on policy. I want to be clear: I am not arguing that the United States will completely abandon Israel’s security now or in the future. But the emphasis in US foreign policy has shifted toward Asia for both economic and military reasons, and that will continue whether a Democrat or Republican occupies the White House. The difference is not fundamental, but it will be felt in Israel. In the wake of current developments in Egypt, Libya, the increasingly tense relations between Turkey and Syria, and the Saudi-Qatari efforts to bring down Assad’s regime, one can see overlapping battles over domestic and regional influence. Could we see the breakout of a multi-actor war in this region? What are the options available to the Obama administration vis-à-vis these developments? That level of conflict is now more likely than it used to be. Assad and the Syrian military have no easy exit from their predicament, no incentive to back away from confrontation. The country’s civil war is both expanding and intensifying, and outsiders now see it as a growing regional risk. Turkey, Saudi Arabia, and Qatar are all backing the opposition—though in different ways and through different channels. The interests of these three governments will eventually diverge because their visions of the region’s future are quite different. But for now, all see an opportunity to boost Sunni standing in Syria, weaken Iran, and extend their own influence. On the other hand, the Americans and Europeans are too preoccupied with challenges at home to get more deeply involved. Obama faces a close election and doesn’t need any additional risks and surprises. European leaders must restore confidence in the eurozone before looking for complicated adventures abroad. The result is that this conflict will get messier in coming months. Assad probably won’t survive over the longer term, but he doesn’t appear to be in imminent danger. But other countries are being drawn into the conflict, adding an element of dangerous unpredictability that could play out in the region as a whole.